Early this past Fall, HealthFinders Collaborative hosted Rice County’s first Local Health System Summit. The summit brought together leaders from major local health organizations, including competing health systems to discuss how we might deepen our collective work. Executive leadership from Allina Health’s District One Hospital, the Allina Medical Clinics of Faribault and Northfield, Mayo Clinic Health System, Northfield Hospital and Clinics, Sterling Pharmacy, Rice County Public Health, and HealthFinders gathered to build upon our common goal: to improve patient care and outcomes for all patients, including those in underserved populations. HealthFinders has longstanding partnerships with these local health system organizations and typically engages with them individually through quarterly leadership meetings. However, these organizations recognized the need to bring all agencies together to effectively identify ways to work together to provide better care for the underserved. As the nexus in common with all the system organizations, HealthFinders was the natural convener and the Local Health System Summit was born. Medtronic Foundation – a HealthFinders supporter – agreed to sponsor the event because they too, strongly believe in the power of the health systems working together to achieve positive results. The event acted as a compliment a Social Determinants of Health Forum facilitated by HFC this summer, where institutions across the human services sector came together to deepen collaboration around housing, education, nutrition, transportation, and more. The health system summit, however, pushed these institutions to think specifically about what they might do to support health and health care for the underserved in our community. By the end of the evening the walls were filled with lists, ideas, and possibilities. Perhaps the biggest success, the group also committed to continue this momentum and agreed to meet monthly to continue problem-solving together. 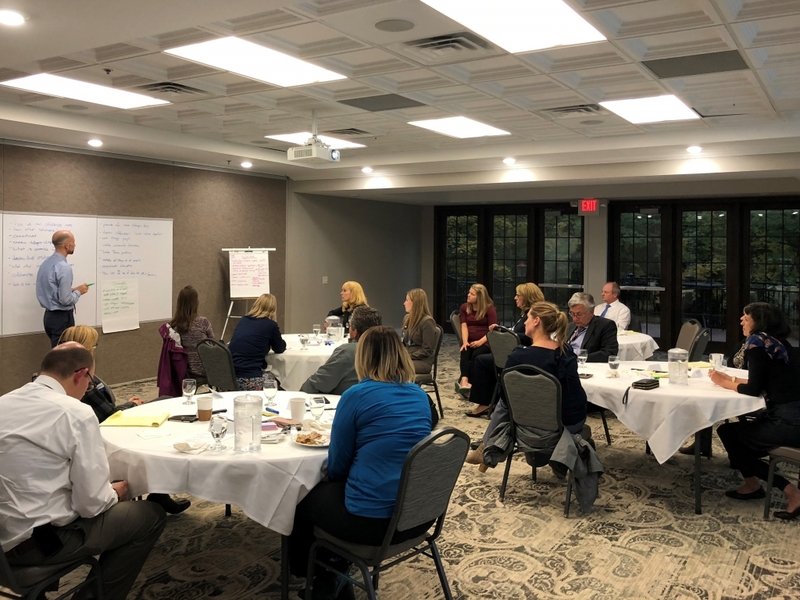 Stay tuned for more details and progress as the group continues to meet, building system-wide collaboration for the underserved in Rice County!